Make a statement at your next special event with the stunning True Destiny Bangle by Krystal Couture. This bracelet features an intricate design with Swarovski crystals but overall is simple in style so works as a fabulous finishing touch when you rent a black evening gown or pastel lace midi dress. 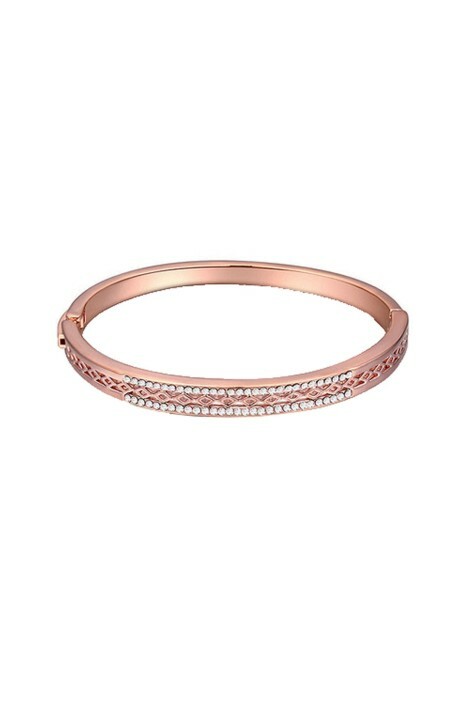 This sweet rose gold bangle is perfect to wear to your next formal event! Complete this decadent evening look and hire the dazzling Gem Crystal Covered Pod by Olga Berg, for the perfect finishing touch! Read our latest blog post, ‘Black-Tie Dress Code - A GlamCorner Guide’ for all the beauty and styling inspiration you need for the upcoming party season! Classic and contemporary, Krystal Couture has established a fine jewellery collection that is simple, elegant and quintessentially feminine. With high-quality craftsmanship and a dedicated team to ensure first-rate design, each piece tells a unique story.